Indonesian soldiers and rescue team carry body bag containing victim at collapsed house following an earthquake in Lombok Island, Indonesia. A magnitude 6.2 earthquake rocked Indonesia’s Lombok on Thursday, with witnesses reporting collapsed buildings, the latest in a series of tremors on the tropical tourist island that have killed more than 150 people in the past two weeks. Witnesses reporting on the aftermath of last Sunday’s quake in the north of the island said people ran out onto roads in panic and some buildings collapsed. “Evacuees and people ran out of houses when they felt the strong shake of the 6.2 magnitude quake …. People are still traumatized. Some buildings were damaged further because of this quake,” Sutopo Purwo Nugroho, a spokesman for Indonesia’s disaster mitigation agency (BNPB), said on Twitter. Officials said the quake’s epicenter was on land and so there was no risk of a tsunami. People crowd on the shore as they attempt to leave the Gili Islands after an earthquake in Lombok, Indonesia. 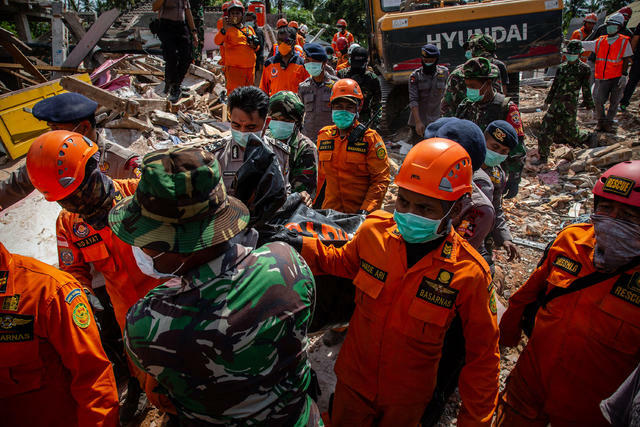 BNPB’s official death toll from Sunday’s quake stood at 131 on Wednesday, although some Indonesian officials put the number at 347. Sutopo did not give an updated toll, only that there had been “a big increase”.